Overtelling, pointing out the already obvious, undermines our writing. In a sense, “Trust your reader” is another way of saying “Trust yourself.” Err on the side of telling too little. Let your story speak for itself. And if your Beta readers or your editors don’t understand something, they’ll let you know and you can bolster the narrative with a bit more exposition. Today on the blog tour, I stop by to visit with the wonderful Melissa Gilbert. My post on Melissa’s site (The Enchanted Alley) is on things I’ve learned in my years as a professional writer. You can find the post here, along with more information about my LonTobyn Chronicle, which I have edited and re-released . I hope you enjoy the post, and I hope you’ll check out the books! I’m pushing myself to take all sorts of creative chances, following bolder storylines and developing exotic characters. I’m writing leaner, sparser, the way I wish I’d written the old books. In short, I’m trying to make this next project something that the younger me would think was totally cool and the older me sees as an expression of all I’ve learned through my career about writing and storytelling. Today I’m pleased to direct you to two stops on the 2016 Fall Blog Tour (formerly known as the 2016 Summer/Fall Blog Tour). 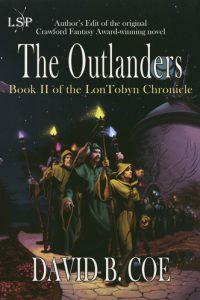 First, Bea’s Book Nook has (very positive) reviews up of the Author’s Edits of Children of Amarid and The Outlanders, the first two books in my LonTobyn Chronicle. You’ll also find excerpts from both books. You can see the reviews and excerpts here. I also have a post up at the Beauty in Ruins blog spot. The title of the post is “A Creative Dialog with Myself,” and it’s about the challenges and rewards of going back to edit the LonTobyn series, which was my first published work. Visiting this site also gives you the opportunity to enter a contest to win copies of the books. You can find this post here. The blog tour continues today with a post at Book Whispers about the magic system in my LonTobyn Chronicle, which I am re-releasing this year in edited form. The magic for these books grows out of my lifelong interest in birds and my love of birds of prey: raptors and owls. You can find the post here. The Author’s Edits of books one and two, Children of Amarid and The Outlanders, are now out and available in ebook and paper formats. 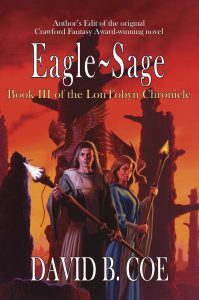 And the ebook of Eagle-Sage, the final book in the trilogy, is now available as well. The paper version should be out soon.